All roads lead to Seneca Lake, an icon of the pristine Finger Lakes. 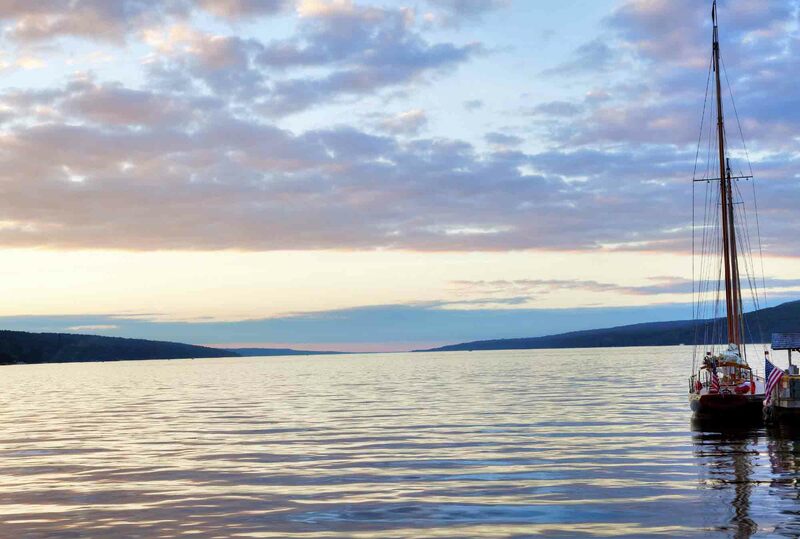 Seneca Lake is the largest and deepest of the glacial lakes Finger Lakes, and, like the lake trout that make us the Lake Trout Capital of the World, salty adventures to suit everyone’s tastes absolutely abound. Glenora Winery (less than 5 minutes away): Year-round luxury Inn; Verasions Restaurant with indoor and outdoor dining; Winery with gift shop. View from all locations is magnificent. Seneca Lake Wine Trail: Full map & list with key. Foodies – Local and regional cuisine color our restaurants in and around Dundee, NY. Bob & Barbara are happy to make recommendations. Verasions Restaurant, at award-winning Glenora Wine Cellars, is a hop, skip and a jump away. Breakfast, Lunch, Dinner, & Lounge menus available. Verasions Restaurant (less than 5 minutes away): Regional cuisine with breakfast, lunch, dinner, & lounge menu in beautiful setting that overlooks vineyards and Seneca Lake. Captain Bill’s Dinner Cruises (12 minutes) – Sightseeing, lunch and dinner cruises daily on Seneca Lake. Recommendations: Bob & Barbara are happy to make suggestions to suit your tastes. Sport – Fisherman the country over partake in the Lake Trout National Derby and enjoy fishing in Catharine’s Creek. Golfers have their pick of several courses, clubs, & driving ranges including a 9-holes at Fox Run Golf Club in Johnston, NY. Charter Sails on Historic Schooner (12 minutes) – Schooner Excursions, and the classic 1926 John Alden designed Schooner Malabar VII. Winner of The Newport/ Bermuda Race of 1926! Seneca Sailing Adventures (12 minutes) – Unwind or assist with trimming the sail, guiding the helm, and experience the exhilaration of sailing by your own hand aboard the Sailing Vessel, “Lee Sea Anne” or reserve a private sail aboard the capable 38-foot Cutter rigged Pilothouse vessel. Weather permitting. Experience crew. A memory you will always cherish. History – Proud to call our region home to Women’s & Aviation History with the Seneca Falls Women’s Rights Museum and the Glenn H. Curtiss Aviation Museum. Seneca Falls Women’s Museum (45 minutes) – 4 mjor historical properties and a state-of-the-art Visitor Center. Inspirational film and exhibits, Wesleyan Chapel, tour the Elizabeth Cady Stanton home. Glenn H. Curtiss Aviation Museum (35 minutes) – Located in quaint Hammondsport Village. Source documents and photographs, including: glass platesto illuminate the history of early American aviation and Glenn Hammond Curtis. Arts & Education – The arts and education flourish. Fine area artists, museums, colleges, & universities. Cornell University and Ithaca College, both in Ithaca, NY, along with Hobart & William Smith Colleges and Keuka College all have a respectable presence. Corning Glass Museum (45 minutes) – Live glass blowing overlooking a working glass factory and world-renowned treasures such as Tiffany’s glass pieces. Cornell Arboretum (45 minutes) – Gardens are free and open from dawn to dusk, year round. Peak season: May through September. Recreation – Watkins Glen State Park and Watkins Glen International Raceway provide family fun and days of discovery. Watkins Glen State Park (12 minutes) – 200-ft cliffs, 19 waterfalls, breathtaking views. Hiking trails overlook the gorge path. Watkins Glen International Raceway (20 minutes) – Formula One, Can-Am, Trans-Am and Indy cars. Famous racers like: Jackie Stewart, Mario Andretti, Bobby Unser and Mark Donahue, Mark Martin, Tony Stewart, and Jeff Gordon. Crafts, Antiques, & Shopping – The Windmill Farm & Craft Market hosts 250 vendors and craftsmen every Saturday. Waterloo Premium Outlets boast the finest in brand name clothing, house ware, and more. Windmill Farm and Craft Market (15 minutes) – 26-acre site with 3 main buildings, a street of shops, and a produce shed all nestled among the pines. Plays host to more than 250 vendors and craftsmen every Saturday. Boasting everything from farm fresh produce to on-site Chiropractic services. Many people plan to spend the entire day at The Windmill and enjoy a picnic on the beautifully landscaped grounds. Flower gardens and a fishpond with water lilies add a touch of beauty. Waterloo Premium Outlets (40 minutes) – Save at over 100 stores including Brooks Bros., Coach, Eddie Bauer, Gap, J Crew, Jones NY, Liz Claiborne, and Ralph Lauren.